Exactly how how do you test the PSUs out on the Apple iMacs? How do you turn on the iMac G5 power supply when it is out of the computer? On the 661-3350 power supply and other similar PSUs, jumper pins 15 (gray) and 16 (blk/gnd) to turn the PSU on. With the power supply on, you should be able to read all the voltages listed above with a DC voltage meter. Between pins 22 and any GND pin, you will see approx. 24vdc, which is needed for the backlight. Note that the plug is numbered on the wired side of the connector plug. You will need some good lighting to see the numbers. A small flashlight comes in handy. When reading the voltages, it is always a good idea to check both for proper DC voltage and AC ripple voltage. Note that AC ripple voltage should be relatively low, in the low millivolts range. From what I have been able to tell, the other power supplies in both the 17 inch and 20 inch iMac G5 computers all used the same DC voltage pinout arrangements. I believe the voltage pinout arrangements are different on the Intel iMacs and some of the iSight models. 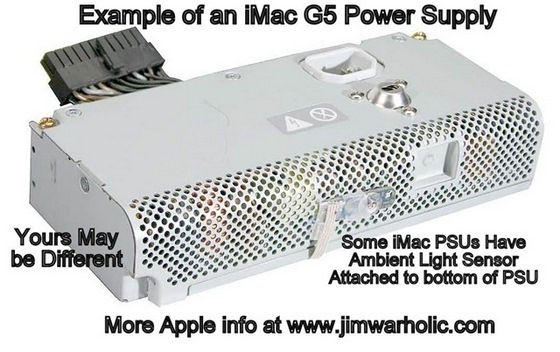 Please read the detailed information for repairing Apple iMac G5 power supplies. Note: (see below) PG acronym represents the Power Good signal and VSB represents Voltage Stand By. If anyone has more information for any of the power supplies (especially the pinout arrangement) used on the various Mac products, including the various PPC models, Intel Models, and Power Macs, please send it to me. Voltage pinouts listed above cover the following Apple PSUs: 661-3350, 661-3289, 614-0353, 614-0296, 614-0297, 661-3351 614-0923 614-0352 614-0294, AP14P46, 614-0398, 614-0326, 661-3625, 661-3289, AP13PC97, 614-0279, DPS-180SB, A 614-0334, 614-0366, 614-0326, 614-0398, 614-0353, 614-0328, 661-3627, 614-0327, 614-0325, 614-0365, 614-0329, 661-3290, Manufacturer Part Numbers: DPS-180QB-1A Rev 01, API4PC47, DPS-180QB ) along with a number of different manufacturers including: (ACBel API3PC96 – Celetronix Q45B – NPFC), and additional manufacturers’ part numbers than what is listed here. PG acronym represents the Power Good signal. I found the following reference in the Wikipedia when it comes to talking about power supplies in general for PCs. In addition to the voltages and currents that a computer needs to operate, power supplies also provide a signal called the Power-Good signal, sometimes written as Power_OK or Power_Good or you can distinguish it by its gray color. Its purpose is to tell the computer all is well with the power supply and that the computer can continue to operate normally. If the Power-Good signal is not present at startup, the CPU is held in reset state. If a Power-Good signal goes down during operation the CPU will shutdown. The Power-Good signal prevents the computer from attempting to operate on improper voltages and damaging itself. The ATX specification defines the Power-Good signal as a +5 volt (V) signal generated in the power supply when it has passed its internal self-tests and the outputs have stabilized. This normally takes between 0.1 and 0.5 seconds after the power supply is switched on. The signal is then sent to the motherboard, where it is received by the processor timer chip that controls the reset line to the processor. Here is the procedure that I used to replace the capacitors on the Apple iMac G5 MOB. Lay the iMac face down on a soft, protected surface. Back cover removal. (Loosen the three screws on the bottom lower edge, then lift up carefully from the bottom up). Take close up pictures of your G5 mother board and inside the iMac for your reference in case you need to refer to something for proper installation. Power supply removal ( http://manuals.info.apple.com/en/imacg5_17inch_Power_Supply.pdf ). Verify Power Supply capacitors are not bulging or blown out. Lower left two small plug connectors undo by carefully taking needle-nose pliers and tug the plugs upwards to disconnect them. Airport option removal, being careful not to break the very delicate antenna wire clip. You might want to leave the wire attached and just move the Airport out of the way. Then remove the Torx mounting screws. See the special 12-in-1 screwdriver with Torx and Phillips bits. Carefully lift out the MOB, making sure all the mounting screws were removed. Do not force it. Heat up the soldering iron, with a wide tip attached, and working from the bottom and the top of the MOB, with the MOB tilted up on edge, heat up one leg of a capacitor on the backside and rock the capacitor slightly from the top. Then do the other leg, and the cap will come out of the hole. Remove all capacitors in the groups. Once the holes are clear, (pins work well), then place the high quality low ESR capacitors in the holes, making sure the positive and negative legs of the capacitors are properly situated in the holes. Do not install caps backwards. Major damage will most likely result. Apply Arctic Silver thermal paste heat sink compound to the small area (make sure it is cleaned with isopropyl alcohol), on the bottom of CPU. Cover it and the matching heat sink area with a thin layer (not to excess). Use a small razor blade as a scraper to remove the excess. Keep it thin, thin, and thin. Reassemble the motherboard, (don’t forget the white light tube that displays the “power on” light on the front cover of the iMac), hard drive, DVD/CD Super drive, cables, plugs, fan covers, memory modules, and make sure you don’t have any extra screws left over. Double check and triple check your work. Place the back cover on. Plug everything back in and turn it on. Don’t forget to put new heatsink compound back on the bottom of the processor chip, which is located on the bottom of the MOB, and the solid plate heatsink assembly located on the chassis: Arctic Silver. Several heating up and cooling down cycles is required for maximum thermal heatsinking effectiveness. At least a 60 watt soldering iron is recommended and a good solder sucker and some plastic headed sewing pins for heating up and push removing solder from holes. Read the article: Soldering Tips for Lead-Free Solder for more detailed information. Use rosin core solder only. Do not use acid core or acid flux. Use lead free, or, in my opinion even standard 60/40 leaded solder will work (although there are few lead-free caveats) for soldering the new caps. Just make sure there are no cold solder joints. How to Tip: Use a few small pins to clear the holes when the soldering iron is used to heat up the holes to remove the old solder. Don’t try to bypass this advice. Highly recommend replacing all the caps in both groups. Even though one or two caps might be visibly bad, the others are more than likely weak or on their way out too. It’s up to you if you want to attempt the repair. It depends on how comfortable you feel about doing it yourself. The degree of difficulty on MOB caps replacement on a scale of 1 to 10, with 1 being the easiest and 10 being the hardest; a 7. Double check your power supply unit. Open the PSU to check those capacitors too. Degree of difficulty on PSU caps replacement on a scale of 1 to 10; a 3. The procedure above is going off of memory. Layout your screws as you go. Have lots of room to lay it out. Refer to my articles, read carefully, and suggest printing them out for reference.